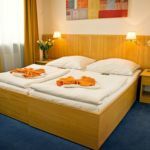 Rooms, services Hotel Nabucco Prague is offering 27 nicely furnished rooms to stay in to those seeking accommodation in Prague. You may taste delicious, fresh meals in the restaurant of the hotel every day. You may park your vehicle in a parking lot available on the spot. The local gym will provide a great opportunity to do sports and exercises. Upon preliminary request airport transfer is provided. We recommend the possibility to rent a conference room especially to corporate partners. In the safe your valuables may be the safely secured. If you have a suitable portable device, you can connect to the Internet for free via a wireless network (WiFi) available in the rooms. 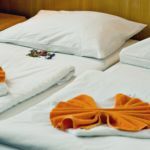 You can find the exact list of services provided by Hotel Nabucco Prague (including those for extra fees) and the exact equipment of the rooms on the information sheet below. Location Advent market in Prague is located 3.7 km away. Arrival, opening hours The earliest time for arrival and check-in is 14:00, the latest time for departure and check-out is 12:00.